Today I will show you how to create a custom looking retweet box like the one I have at the end of this post. This custom retweet box is more interactive than the traditional retweet buttons and encourages your readers to retweet your post. After implementing this retweet box the number of retweets in my blog increased considerably. This retweet box is based on twitter @anywhere frame work. 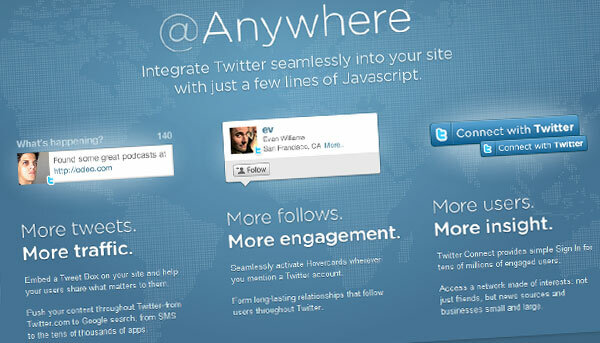 @Anywhere is a new collection of free, simple web tools and APIs that enable websites to easily integrate Twitter functionality into their website. In other words, Twitter users will be able to engage with existing Twitter features from anywhere on the web. @Anywhere makes existing Twitter functions (such as replying, posting Tweets, and following) available outside of twitter.com. Connecting to Twitter via third party sites that integrate @Anywhere is just like using a third party app. 2. Application Website: This is your application’s home page; put your blog’s address here. 3. Organization: Name of your organization, your blog’s name is enough. 4. Callback URL: This is the place where the application returns after successful authenticating. If you are using the @anywhere application for a blog then leave your blog’s home page as Callback URL. 5. Default Access Type : This is the type of access granting to the application. For the @anywhere application you should give Read & Write access. 6. Application Icon : This is not must, but if you want then you upload an icon for your application. 7. Enter the Captcha and Click Register Application. Now your @anywhere app is created now we want to integrate it to our blog. There are a lot of twitter@anywhere plugins available but I prefer twitter@anywhere plus for integrating @anywhere functions in your blog. 2. Go to settings –> Twitter @anywhere plus. 3. 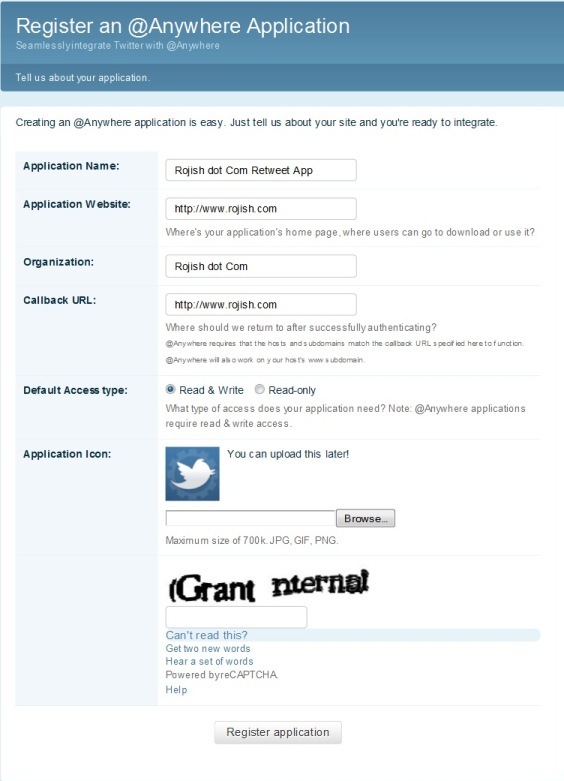 Enter your Your @Anywhere API key (You will get this after registering your application). 4. Auto-linkification of @usernames – Enabling this will turn twitter usernames in to links. 5. Hovercards – Enabling hover cards will show hovercard when you move the mouse over a twitter username. 6. Follow button – This is an easy way to add follow buttons inside the posts. 7. 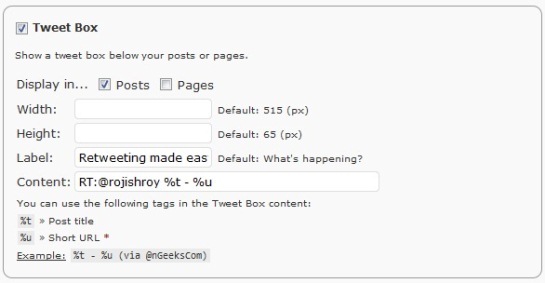 Tweet Box – Here we give settings of our custom retweet box. You can choose whether to display your retweet box in posts or pages or both. Now enter the width and height of your retweet box (default is 515px and 65px respectively). Label: Here you can give the text to show above the retweet box. You can give ‘Retweeting made easy’ , ‘Look how Look how easy I made it for you to RT’ etc. Let your imagination fly. Attractive labels attract more retweets. 8. URL shortener: You can choose bit.ly, is.gd URL shorteners or choose None to leave it to default WordPress URL shortner. But the WordPress shortened URL’s will look like https://rojish.com/?p=123 . This doesn’t look well. So I prefer bit.ly shortening (also studies shows that bit.ly links are more likely to click by twitter users). For that you have to register a bit.ly account first. Then you can get your bit.ly API from this link. 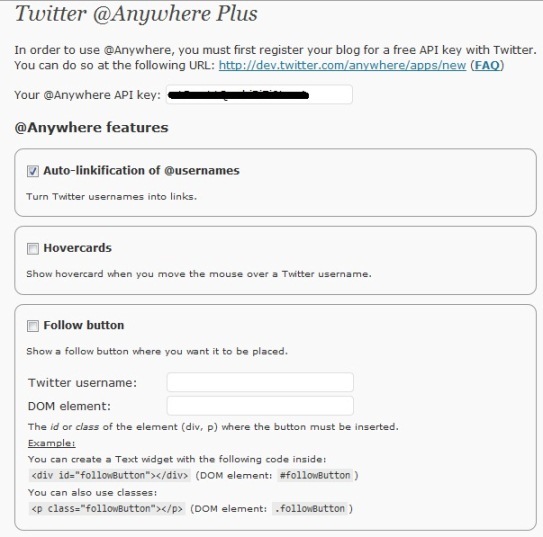 Add this API to twitter @anywhere plus settings. Don’t forget to save settings. Thanks man. Finally, I made it on one of my blogs. Great job. Fixed the typo but the title says “how-to-create-a-custom-retweet-rox-using-twitter-anywhere”. It’s may affect SEO. Nice post. I use this plugin with Twitter-link-comments so that people can access twitter profiles from my site :). Thanks Rojish this can help many people, your article is as always very useful. I am using this plugin and I have felt that this is the best plugin of all the tweet and retweet plugins available since it is an all in one plugin that provide tweet box, hover link, retweet button, follow box. I appreciate your writing for explaining with step-wise instructions. It’s good plugin to help me and visitor an easy way to retweet Twitter message. M planning either to install this as a plugin or have a code for it ! very easy….. hope i can install it…..
i am going to create one for my blog ……..
nice article rojish, it’s really good one. I would love to create one for my website. I’ve been looking for some good instructions on this…Thanks. I will be rt this and using it for clients. Thanks. This was an excellent post and has helped me set this up on my site. Thank you for taking the time to do the screen shots to help ungeeky people (such as myself) in being able to install so easily. Glad to know that you found my tutorial useful. Thanks for stopping by and dropping a comment, have a great day! Thanks for the DIY. I am going to try making one for my website. Twitter is such a great marketing strategy. Thanks for the detailed instructions. I probably wouldn’t be able to make one without your example. I have been searching for how to create custom retweet box for a long time. Finally, I learned How to Create It..
Wow! This will work perfectly for me as i am trying to make my own retweet box. Thank you for teaching me how to do so. Have a nice day! Thanks for the tutorial. Your title misspelling must not have hurt your SEO too badly, because I found this post using Google to search for retweet boxes. This is just what I need for my blogs, THX.